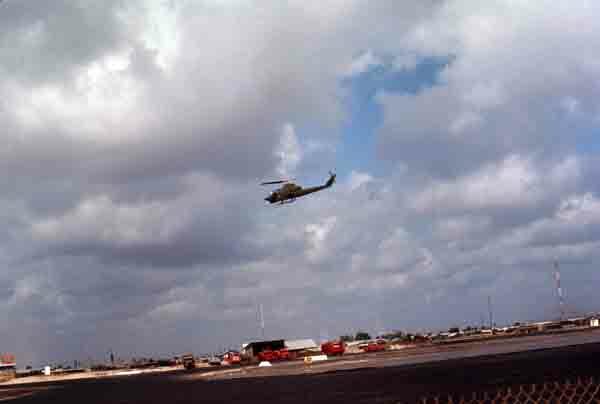 Most air traffic at Tay Ninh airport was helicopters of all types. They took off and landed 24/7 so this was a place of action. Helicopters did not take off from here lifting straight up or land straight down unless they had no other option. Pilots like to lift off a few feet high then move forward rapidly before climbing. They were less of a target operating this way and they landed in much the same way. Large 4 engine propeller driven planes landed but I do not know if jet driven aircraft used the runway. The fire fighting unit worked hard and long hours as many helicopters limped back and were a danger for some time after they landed. Men doing fire fighting work suffered a wide variety of bad events.